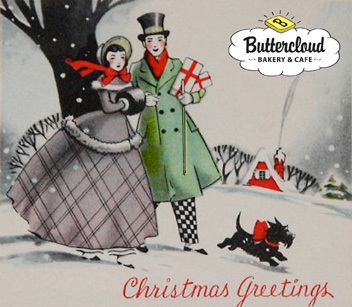 We will be closed on December 25th for Christmas and on January 1st for New Year's, but other than that we will be open our normal hours for all your holiday entertaining needs. If you need anything for a holiday party don't forget to pre-order one of our selection of pies, cookies, cheesecakes and tarts (for details click here). And for you procrastinators out there we have gift certificates available in any denomination and they never expire! We've also got the always fashionable Buttercloud logo shirts and mugs! Hope your holidays are safe and happy!